Well hello there! Safer Internet 2018 is coming up on Tuesday, 6th February 2018. 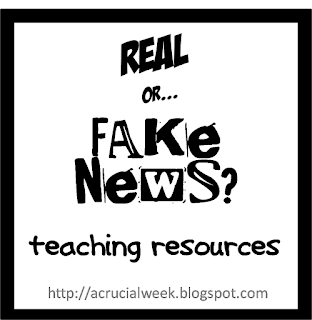 I thought "fake news" would be a fun theme to work with this year. I've put together these "Real or fake news?" resources to use with our older primary school children. If you want to use them, click here or on the image to the left to download the resources (photo prompts, response sheets and lesson plan) for free from Google Drive. I've made them so you can print the photo prompts and use the QR codes on tablets to access or, alternatively, you can share the PDF digitally with your children and they can click directly on the links.